Ectaco, Inc., the world leader in portable translation technology, has tailored its education oriented jetBook Color with exceptional security features for the Department of Defense. These features are designed to eliminate access to the device by anyone other than the specified user, and promote a complete standalone unit safe for travel and use within the DoD. 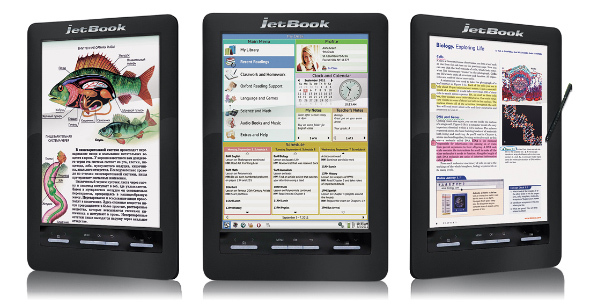 The jetBook Color is the only touchscreen Color E Ink eBook Reader in the world. It’s also the only one that promotes the idea of “healthy reading” by using ambient light to produce color. The most important part of the DoD project was to customize the security features making the unit completely impenetrable by third party access and applications. By eliminating the WiFi option, microphone, and a few other features, the device becomes solely accessible by the user only. An additional partition was added as a security measure that disallows the transfer of any documents on the jetBook Color to any other device - meaning that anything on the unit cannot be taken off the unit unless deleted. This ensures that confidential documents stay in their rightful place. The features added were based on special request as the iPad and other Android devices were not capable of providing such safety measures. The Department of Defense has a reputation of being at the forefront of safety and security. By using the jetBook Color in their divisions they'll continue the trend. Instead of lugging important paper documents, personnel can be equipped with units weighing just 1 pound and capable of storing every document needed – securely. Users will also have the ability of using the jetBook Color as a notebook where they can freely write on the screen using a supplied stylus that fits into the device. This methodology eliminates the loss of vital notes and paperwork. "With the products we developed specifically for the Department of Defense in the past, it was inevitable to introduce our newest jetBook Color", states David Lubinitsky, CEO, Ectaco, Inc. "The added security features make this the only device safe and protected enough to be used by the DoD."